Photographs kindly supplied by Garfield Kennedy. 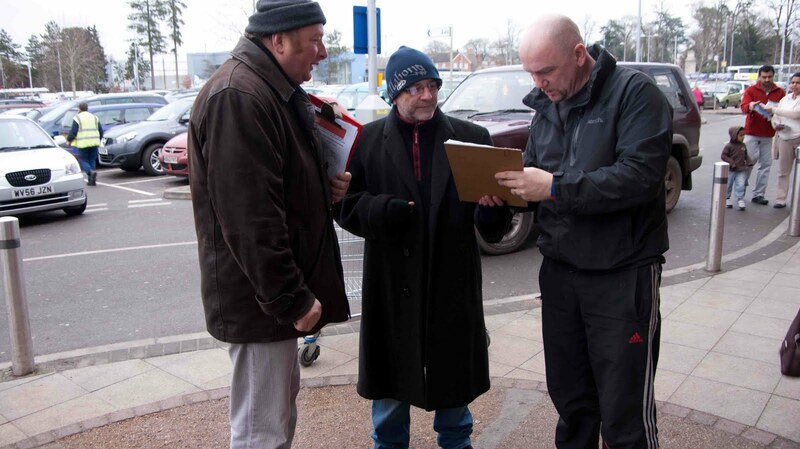 Your Town Councillors and district councillor Garfield Kennedy was out this morning collecting signatories to help save the Library, we collected a very good 1500 signatories, whilst people were extremely busy, they seemed extremely happy to stop and sign our petition. The message is clear. People value our Libaries. 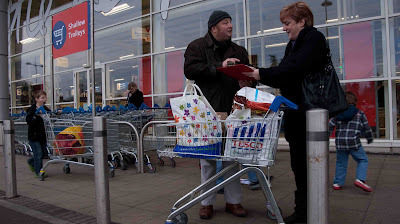 It is also gratifying that people seemed pleased we were out collecting signatories. I would say New Years Eve is not the greatest time to be asking people for their time outside a supermarket, but Thank You for everyone who spared us the time, together we can make the case for a properly funded Library here in Shepton. If you would like to sign the petition or want to help see link below. I began the year talking about the last Labour governments attempts to keep people in jobs with the various schemes and strategies. This bore fruit in the middle to late part of the year, with unemployment falling, but since the general election and austerity measures biting there are signs of unemployment starting to rise again. The Town Council has staggered on for another year, directionless alone, The Town Council surrendered the Quality Status standard as for the previous three years the council never produced newsletters or communicated with it's parish, a qualifying standard, but those cheeky Tories didn't remove it from our letterheads, until they were reminded that they haven't met the standard. In the last couple of months talking about our budget, it's seemed like living in a parallel universe, County and District Council slashing and burning services and from the Town Council ivory tower, were talking about yellow lining in West Shepton and Red telephone boxes. Sublime. In March we planted a tree in remembrance of Brian White the former Town Clerk, a truly likable and knowledgeable man who is sadly missed. I attended the interviews for a new headteacher at Whitstone. We had a number of talented applicants, but Gill Rennard had an exceptional presentation and interviewed very well and Shepton is lucky to have secured her services. The General Election was a huge personal disappointment, the first I had not fought in the Wells Constituency, it was fought in the backdrop of the deepest recession for generations, for all Gordon Brown's failings, history will be kinder to him than popular opinion of today. I cannot conceive the damage that Osbourne would of done, no bailout of Northern Rock, austerity even earlier. OUCH. In Shepton West we had elections in May, June and July, I stood for Labour in the Shepton West Mendip by election, Ashley Taylor the Conservatives expulsion for non attendance, The new politics has been exposed to the sweet mid somerset air, we have seen five months of barely covered anger between local Conservatives and Lib Dems, the new Lib Dem councillor seemingly able to wind up the local Tories at every post, why do the local cons have no sense perspective or of irony? Can this be because of their need to control every moment of council life. Tragic. It's slightly ironic that the 30 year rule documents are released and Mrs T's economic experiment was running into trouble in 1980, the period of my political education, now tell me the importance of history. The coming year will see the implementation of the cuts agenda, the cuts we know about and the cuts we are unaware, the privatisation agenda for the NHS, Councils given the freedom to slash and burn local services. The interesting point is whether the private sector jobs promised by Osbourne materialise, whether you turn public sector jobs off to be replaced by turning private sector jobs on. And whether you can take billions of pounds out of the economy through 300/400,000's of jobs, wages and cuts to benefits and increase VAT and this will lead to less or more spending. I suspect good times might be rationed to those who have and those who haven't, well 2011 is going to be a very tough year. I met with a number of Town Councillors today to discuss further our response to the County Council's proposal to close our Library here in Shepton. We have decided to try and arrange a delegation of representatives from the Towns threatened by closure of libraries to Eric Pickles. We want to ask about the legality of these closures under The Public Libraries and Museums Act 1964, also about double taxation of those Towns asked to pay to keep their libraries open. 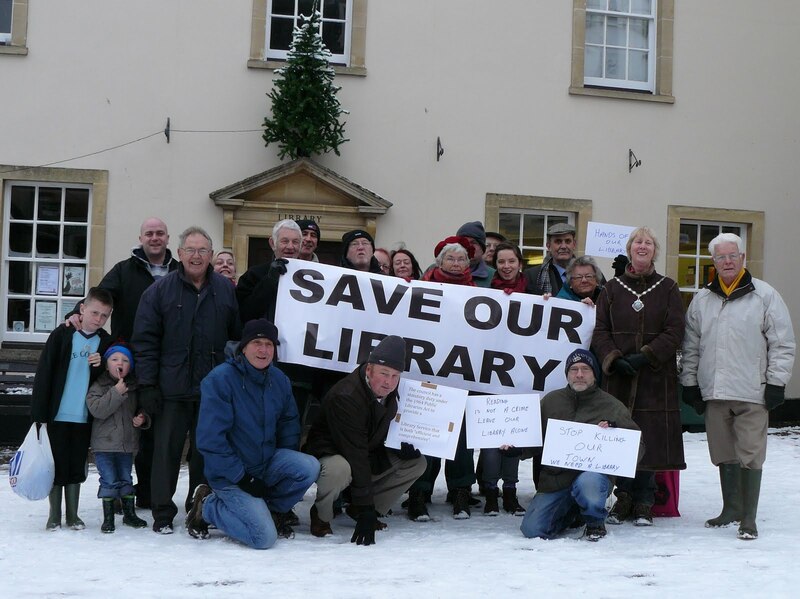 This Friday Town Councillors will be out in the Town collecting signatures on the petition to ask the County Council to review this decision to close our library. The best solution will be for the County Council to reconsider their policy. The first step is for everyone who believes the closure of the library is wrong is to sign the petition and then get their loved ones and friends to do the same. In the new year we will be organising meetings with stakeholders to try and discover further facts, we will then have a public meeting to look at the options open to Shepton. It is so important that everyone who wants to get involved in the fight to save our Library is given the opportunity to do so, our library is worth fighting for! Merry Christmas to everyone. I wish everyone a peaceful and happy Christmas. The challenges for 2011 will be many, more of that later. It is a great time to reflect on those who are much worse off than ourselves, whether our brave military personnel serving in foreign fields. Those people whom are living in desperate situations. Material things are not everything. we sometimes forget. Hope to return in 2011. Tuesday night and here in Shepton we were treated to the lantern parade from Collett Park to the Market Place, with the fantastic drumming band, electrifying the atmosphere, a real treat. This evening I had a telephone call from the YES AV referendum campaign, asking me to take part in the campaign to change the electoral system. A cheerful young lady, I told her at this point I could not support the campaign, why would I support an electoral system that is not proportional? She told me this was the first stage in the process, I said it felt more like a grubby little deal for Lib Dems to get sell out in government! She said the Yes campaign would contact me later in the new year. After Fridays photo shoot with other councillors and public 'Save our Library', I awaited notification of change of agenda for the closed Community Development meeting tomorrow evening, to include the Shepton Library on the agenda, so after lunch I put in a request for the Library to be placed on for discussion as late business, I've yet to get a response. The new year will see the cuts details become so much clearer, I for one believe some services are worth fighting for; services for young people, housing and educational achievement are very important, with so little time, my time will be placed defending public services rather than a none proportional voting system. The next question how will I vote in the referendum? Good question! Now the spectre of cuts has become reality here in Somerset, it is interesting to see how everyone reacts to these cuts. Let's start with the Conservatives, Eric Pickles he changes the language and definition of the grants to local government, 'spending power' is the new language, a formula that has taken local councillors officers much time to unpick, this made up of the old rate support grant, reserves, council tax collection, NHS care budgets to name a few. Even the local Conservatives are angry by sleight of hand of Eric Pickles. Local Conservatives have a choice they can disassociate themselves from their Conservative betters like Mr Shapps, housing minister who says there are 'no excuses to cuts to front line services' (BBC website) or they can agree up to them. The Lib Dems coalition partners, we are seeing a real split between local activists and the leading Lib Dems, in the independent newspaper we are seeing Council leaders like Cllr Kemp of Liverpool calling for his leader Nick Clegg to 'rein in' Pickles and Shapps and calling them 'Laural and Hardy', but a spokesman for Nick Clegg has told the Independent these are NOT the views of the Liberal Democrats in government. These cuts to local government are front loaded to take place in the first two years of the coalition government. Cllr Kemp says the governments in general but specifically Pickles and Shapps 'Their behaviour is a disgrace, they don't know how serious the situation is they created by getting brownie points by front loading or deliberately trying to distract attention from the problems they have created'. The problem for Cllr Kemp is the Chief Secretary to the Treasury Daniel Alexander is the holder of the purse, so all this would have been agreed with him. Again it time for the Lib Dems to disassociate themselves with these large front loaded cuts to local authorities. These are the choices made with cutting harder and faster than Labour had stated, and to be fair before the election the Lib Dems, the direct outcome of these front loaded cuts are loss of services, jobs and economic spending power in our local communities. As a Labour councillor, I will work with everyone to campaign against these cuts or to mitigate the impact of these cuts. For what it is worth I like Laurel and Hardy, Pickles and Shapps are more likely to cause indigestion. Today we have received notice that the Shepton Mallet Library is under threat of closure from the County Council, the Library is a community resource that is used by young and old alike, my family use it for books and for computer skills, this giving confidence and improvements to our quality of life. Libraries offer the joy of self learning, an invaluable community resource, that has been on Shepton's High Street for decades. I attended the Mendip Council cabinet meeting this evening, this to discover the level of cuts required for Mendip to balance their books. This year Mendip will have to cut more than 14.8% to balance their books for the next financial year, it looks like it is going to take up to February for the administration to set a balanced budget. The Arts budget will be removed the voluntary sector grant will be halved, significant redundancies amongst the staff, next year will see no rest bite from these cuts as the cuts are to be front loaded into the first couple of years. I genuinely cannot see the logic in three tier local government, how the Conservatives must regret their campaign to keep District and County Councils, both councils are now slicing services, still having senior and middle managers still having to many overheads. The Mendip Council leader Harvey Siggs was not impressed with his Conservative Secretary of State Eric Pickles, and his sleight of hand when announcing the cuts to rate support grant to Mendip, other councillors said they were 'standing on the obis' others said 'the shelves are bare', Harvey Siggs said he was upset that neither Lib Dem MPs was there at the meeting to support his Conservative administration. Sadly Harvey I think you're on your own! Tonight the planning committee met, there were a few plans; a none controversial conservatory; the relocation of two bunded oil storage tanks on a concrete base, the only issue was making sure of odour protection. 49 Compton Road - the demolition of existing dwelling and erection of 6 dwellings with access and parking. I was unhappy with this application, this application is over developing this site, I felt it was out of character with the location and far too much garden was taken by this development. The planning committee opposed this application on the grounds above, so over to Mendip Council. Domino's pizza - unit 7 Retail Park at Townsend - This was essentially a change of planning category - to permit food in this unit. I argued that do we need another pizza style shop in the Town, a national retailer that is ruthless in terms of advertising and promotion. Mendip did change away from food as this unit was used as the disabled shop, I argued this unit should be further advertised for none food use, sadly the planning committee did not support my proposal and are recommending approval, so over to Mendip Council. There is a feeling that the coalition government is in to much of a hurry to make changes, with to many announcements uncosted or has insufficient detailed information attached. In today's Independent on Sunday, there is a claim that only one in four students will pay off their tuition fees, with a best case scenario of half paying them off. This must have very clear implications for the sustainability of this new scheme for students and universities alike. It would appear that the coalition government are to borrow an additional £5.6 billion by 2015 to pay for the new tuition fees scheme, it is claimed high earning graduates will pay these loans, but the Independents accountant claims because of interest and inflation, groups such as teachers will never pay off the capital. These new tuition fees, increasingly sees the state withdrawing it's financial support for tuition and placing it firmly on students, yet Employers benefit from educated students, Government benefit from educated students through higher taxes, communities benefit from degree educated students and of course the students benefit themselves, I'm not sure the coalition government has got the balance of payment for the cost of fees right. The next debate is the abolition of the Educational Maintenance Allowance, this allows poorer young people to stay on to take A Levels, and to qualify for university, if we are genuinely interested in greater participation, cutting this allowance makes no sense. Today the coalition government won the vote in parliament to increase tuition fees to a maximum of £9000. Nick Clegg voted in favour of the increase. So much for a pledge! I attended the quarterly CAB management meeting this evening, this week being an exceptionally busy week. The meeting was extremely interesting, with further evidence of the mirage of the Big Society and the real struggle people are living with here in rural Somerset. The CAB in Shepton has seen a 10% increase in new clients in the previous eight months, this equates to 721 people/families. These increases about 60% (800 cases a yr)are increasing in debt problems and 35% (300 cases a yr)are employment problems. Shepton bureau are now receiving more enquires than Wells, this a fairly new phenomenon. This year Shepton's CAB has received money for Additional Hours this to fund Wednesday opening, this will cease at the end of this financial year, due to the removal of this funding stream. The funding for the Mendip Advocacy scheme that gives advice to those people with mental health issues will cease at the end of this financial yr, this due to the funding stream drying up, the CAB will try to find other funding streams, but if this unsuccessful, then these vulnerable people will have to come to the CABs or through other carers. The CABs offer Community Legal Advice, this to offer people with legal advice on debt, welfare benefits and housing advice, this in partnership with BANES CAB and Will Rolt Solicitors, this took the Mendip CAB a lot of time and much hard work, for the benefit of local people who needs to access the law. Sadly this service will be axed in the next 12 - 18 months, along with legal aid for family and domestic violence and homelessness, more cuts that hurt the most vulnerable people in our big society. The CAB awaits the next three year funding from the County and District councils. Despite all these cuts to various projects the CAB will continue to offer a tremendous service. I would recommend any worker not in a trade union to join one, they offer legal support, even if your employer won't recognise them, they have solicitors to take an employer who over step the law to an employment tribunal. Tomorrow, I have a Town Council meeting and a Whitstone governors meeting. Yes, it is true father Christmas came to Shepton with his trusty companion for the Christmas light switching on and celebration of the BBCs Turn Back Time. The chamber of commerce and the Town Council continue to fund the Christmas lights, I believe you have to go a long way to beat our Christmas lights. The evening ceremony was children singing, speeches by the BBC and Simon the Ironmonger came to help the carnival queen switch the Christmas tree lights on. The rain held off and the Market Place was full of Sheptonians, so three cheers to the Legacy group for the organisation of the event. So the 1970s will be the next decade to be remembered on our High Street, what a decade that was! I remember the High Street redevelopment, (just), there was a nice collection of photographs on display today. The end of the decade was the end of the post war consensus on economic management, to more free markets and less welfare state. Is this why the young are revolting? Young people are demonstrating again today, locally in Bristol and in London. It is clear that young people are justifiably angry at the broken promises of politicians, it is clearly unwise for politicians to make pledges to students before elections and after change their minds. For example, the likes of Vince Cable who signed the students pledge not to increase student fees, then stated earlier in the week that the coalition agreement was more binding on him then pledges to the electorate, to this week to him being the secretary of state introducing the increases to tuition fees up to £9,000 saying he may not vote for his Bill, but he may abstain for Lib Dem unity. A pointless technicality, as the Tories votes will win the day. The Coalition governments proposal to cut the Educational Maintenance Allowance which is a means tested allowance of between £10 and £30 to keep lower income families in further education, families with joint incomes of under £30,000 could apply. But if we look at the cuts made by the Tory County Council will see 75% cuts in Youth provision in Somerset this means youth clubs and youth workers disapearing with 50% cuts in bus sudsidies and as there are so few services that are profitable and Shepton does not have direct buses to Bath, Bristol. Are we entering a new era of young motivated people, politicised not willing to be grateful for what they receive, or a passing moment? Time will tell. I just spent an enjoyable evening watching Barcelona beat Real Madrid 5-0, Barca play what the Dutch called total football, pass move, cute triangular passing an absolute joy to watch. Nine of the eleven players that finished the game came from Barca's academy, those players understand the philosophy of the club and play accordingly. Barca is a members club, something I hope all football clubs become. Keeping the footballing message going, to paraphrase Brian Clough - you can play any formation you like, but if you don't have the players, you won't win anything. This little message is good for anything in life, if you don't pull together then you'll hang apart. I sometimes think Shepton fails to understand this; like the appeal made to renovate the Market Cross, for me a none controversial little appeal made by the Shepton Mallet Market Cross trustees, I would of thought this could be supported by everyone. The wider point is that the renovation of the Market Cross will need all the partners to contribute, but every penny raised by the public appeal will count as matched funding and a sign of community support. I attended a meeting in June 2006 to discuss the Market Cross, English Heritage took three years to give permission for the works to be carried out on the Market Cross, but as stated English Heritage through the lottery bid now seem a little less helpful. As an on looker, I hope the public fundraising appeal raises a lot of money, but all those in charge of the Market Cross needs to come forward to all funding partners with the budget to renovate the Cross. The other point raised when talking about the appeal was the Town Council's capital fund of £220K. This from the sale of Great Ostry office. This debate around how the Town Council takes Shepton forward has been largely ducked for the previous four years, At a crossroad plan focused on a Community facility, High Street regeneration and Links. Some councillors talk about smaller schemes such as use for the Market Cross, pedestrian crossing outside schools. These are the debates that will be held before the Council before the May elections. Readers will remember on the 2 November my blog made reference to the condition of our Market Cross, it would appear that English Heritage has now given permission to works to be carried out on the monument. It looks like it is going to take about £100,000 to restore the Market Cross, no one could dispute this is Shepton's iconic feature, the truth is there is not the money available to restore it today. At the last Tuesday night planning meeting, Mrs Jeanette Marsh, Chairman of the Council told councillors that she with a local person was going to approach the BBC's 'Turn Back Time' production team to make a financial appeal to help raise the cash required to repair the Market Cross. The Market Cross has it's own trustees, with Mr. Neil Shearn being the Shepton Mallet Market Cross Charity 236427 Chairman who is sponsoring the appeal. I am pleased Mrs Marsh has asked me to publicise the appeal for funds, and through this blog to give contact details of those you could donate monies if you wish, to help save Shepton's iconic Market Cross. If you would like to make a difference and feel you could help, then your financial support would be welcome. The Town is to hold a celebration party on the 3 December and there will be an appeal there also. I attended this years remembrance service at the cenotaph, the sky was heavy and the service conducted in quite heavy rain, this did not deter Sheptonians who attended in my eye in larger numbers than last year. This week, I have another meeting to discuss the landscaping scheme around our cenotaph, we will be hoping to appoint a contractor to do the work, so next year, the works can be completed. I am sure when the new pathing is laid and the new planting is made, this will enhance our cenotaph. The conservation departments at the County Council and the District Council have required the Town council to use the highest quality materials, this has made the project more expensive than first thought. It is right that high quality materials should be used to enhance our cenotaph. The enhancement is to be paid from section 106 Tesco money (agreed with Mendip Council) and from Town Council budgets. The Town councillors are trustees of the cenotaph, we continue to budget for the maintenance of the cenotaph and work with the 'friends of the cenotaph' to keep the memorial in good condition. I was reading another blog regarding the changes to the cost of affordable housing in the future. The blogger was a Bristolstolian. http://www.labourlist.org/social-housing-is-dead often we here how these changes effect people in the cities, but these changes to affordable rents will cause real difficulty to people in our part of Somerset. I have written before about the huge 60% cut in the capital grant for new affordable housing outlined by the new coalition government for the coming period. The new coalition governments policy is for housing associations to generate their own cash to build new 'affordable' homes, this term affordable appears to mean 80% of the market rent. So in the Mendip District, Flourish homes, a part of the Aster Group, are the largest supplier of affordable housing, there is no council housing. This to be coupled with the permanent tenancy for life to be ended, so higher rents with less housing rights. This weekend I note the Bishop of Bath and Wells speaking out about his concerns of the rural communities becoming more impoverished http://www.bbc.co.uk/news/uk-england-somerset-11700917, he stated that ending council housing for life will be a real problem in rural areas, he is right as there is not the availability of housing for people to move onto. The other point he makes is if you want to create the 'big society' people need to feel secure to contribute in their communities, I want to live in a 'good society', not social attitudes from a victorian view of social housing and welfare. Tonight Town Council meeting was unfortunate to clash with the Turn Back Time series filmed in Shepton, as leaving the meeting in time for the show seemed to set the agenda for the meeting. Lets deal with the positives, the Television show was most interesting and it was great to see Sheptonians on the TV. I understand the street party was well received, unfortunately not finishing work until 5.30pm and having a meeting at 6pm, left me no time to attend, which from my perspective didn't seem fair, but that's life! So to the Council meeting, Myself and Councillor John Gilham proposed £500 to spend on Turn Back Time street events, this was defeated, but at least the Town Council grant aided the Victorian street event £250 to pay for the two performing bands. I pointed out that we need to increase footfall in the Town Centre and events are a good way of achieving this. I was surprised the way the Chairman handled Cllr Kennedy's appearance at the Council meeting, she ruled that Allotments were not on the agenda and curtailed his address to the Town Council, OK fine, but then surprisingly she allowed Cllr Terry Marsh to offer Cllr Kennedy advice, I tried to point out the inconsistency of her approach, but was told I had said enough. I was not happy the way the precept (council budget) is being handled this year, tonight the Chairman and Cllr Parham tried to pass a piecemeal part of the precept, at the same time trying to make decisions ahead of other spending commitments that clash with budget heading they were asking us to agree, I abstained on this sorry matter. Give us the full details and then we can agree the whole budget, but be assured this matter will be decided by the portfolio holders and be further assured that any dissenting view points will not be allowed in January. I called for the Chief Executive from Mendip Council to get involved with English Heritage in a push in restoring our Market Cross, this has been going on for over three years, how much longer can this neglect go on! We have now received the bids to enhance the Cenotaph, there is still work to do on the bids and we will meet again in a fortnight to discuss further. The concerns about the governments housing benefit changes are causing particular interest in the national media. As readers of this blog will know, I have a strong belief in locally democratically controlled affordable housing, having the benefit of growing up in a council property, with the security this offered as well as having a decent place to live. No one can dispute the country and this part of the country has a housing problem, clearly we need more affordable housing. So it is with some disappointment that the new government has hit the housing sector with a triple whammy (Shelter's words), cutting housing benefits, slashing affordable capital grants and the change of tenancies and allowing the social housing rents to go near market rents. The housing benefit changes will cause local people pain, 35% of those effected locally are in low paid work it would appear 1320 people in total will be worse off with the average loss per claimant about £15 a week. Forcing people with children to live in overcrowded accommodation will increase health inequalities and will have a detrimental learning impact to children's education. The solution is a balanced housing market, by cutting social housing capital budgets, will make us more reliant on the private landlords who are interested in turning a profit, forcing rents up with less secure tenure. By cutting the capital grants, this will mean fewer jobs in the coming period, with the potential loss of employment and skills and loss of tax revenues, again this will lead to more people chasing fewer rented properties forcing up the cost of rent. If councils have an influx of people whom become homeless because they cannot afford to live with the loss of benefit, where is the temporary accommodation to accommodate them? Applying more pressure on councils. I hope progressive MPs can vote these plans down in parliament, I hope the days of 'Cathy come home' are long gone. Some may find it hard to believe, but I wasn't political until I left school, I and my generation was the recipient of Mrs Thatchers remodelling of the British economy and the brutal economics of Milton Friedman as interpreted by the likes of Keith Joseph. I have read and listened to much in this last week about George Osborne's Comprehensive Spending Review, much detail has yet to be explained in detail. The sad facts of this review is that as the Institute for Fiscal Studies say the poorest in society will pay the highest price, yet this deficit reduction plan had little to do with their sins. The recession was caused by the banking and financial sector that over reached, before the banking crisis struck virtually no political leader was calling for greater regulation of the financial markets and both then opposition parties were criticising labour for not spending enough on education, health and defence. Yet without the actions of the last Labour government saving at least three British banks, pumping money into the economy and boosting demand, we would be talking about a depression, a completely different ball game to the current deficit, as Will Hutton says our national debt has been higher proportionately for the last 200 of the last 250 years. I was interested to read Britain's Noble prize winning economist Professor Christopher Pissarides saying "the chancellor has exaggerating the sovereign risks that are threatening the country." Most economists seem to accept that the coalition government has embarked on a economic experiment. Cutting about 500,000 jobs in the public sector, with other job losses in the private sector as a consequence of public sector cuts. When the last recession it look 6 years to generate 1.2million private sector jobs of which 900,000 of these jobs were in the financial sectors, this time it's projected the financial sector are going to shed 200,000 jobs, it appears the government are reducing 60% capital grants for affordable housing, so fewer jobs there. Even businessman like Arup who support Osbournes cuts are making 600 people redundant in the UK. From 1993 to 1999 the private sector generated 300,000 in sectors other than finance, so is it credible that the private sector can produce 1.2million jobs in the next 5 years. The Japanese in the late 1980's tried this approach to restructure the economy after their property boom and led to a decade of austerity, the Irish republic cut the public sector and this has led to negative growth. I suspect George Osbourne will be more like Keith Joseph, if I right, I rather fear for the coming period. On the BBC website, Harvey Siggs Mendip District Council's Conservative leader http://www.bbc.co.uk/news/uk-england-somerset-11549920 outlines the levels of cuts he expects to be handed down from his conservative government and how he expects this to effect his council and our services. It looks like the Conservatives are expecting £2million worth of cuts in revenue grant from a total of £16million, this a 12.5% reduction, this could lead to 10% cuts in staff and reductions in contractor services. Politicians often talk about listening to people, I believe Mendip's failure is they have never successfully engaged with the communities they are here to serve. The Conservatives say they will not increase Council Tax. They will no doubt raise the Special Expense Rate, Car Park charges and professional fees, these easier to hide and could be called stealthy indirect council tax rises. Harvey Siggs implies there will be more slices of cuts, more generic officers, with less expertise, Mendip Council is increasingly looking a tier of local government for the sake of history (since 1974) it is increasingly looking like a council unable to respond to the challenges of the 21st century. Mendip will need to develop new partnerships, to do this the Council needs a different type of leadership, less arrogant more open and inclusive. Mendip Council does not operate in a bubble, yet this is how it often looks. If Mendip has a future then it's needs to transparently to spell out a vision for it's future, if Mendip's strategy of managed decline of recent years continues, the question will be, do we need this tier of local government? Or so they say, the darkest part of night is just before dawn. Tonight should be the last day Tom Hicks has any association with Liverpool football club, his last desperate act, a restraining order in a Texas court to the sale of LFC, the High Court has given Hicks and Gillette until 4pm tomorrow to withdraw and allow LFC to be free of the acquisition debt they leveraged on the club, and free of the £40million annual debt repayments. Clearly, the best solution for Football clubs would be owned by their supporters ala Barcelona FC, it never ceases to amaze me, supporters will invest £80 a year on replica shirts, hundreds of pounds on tickets and even more on pre and post match lubricant (ha ha). However, in the short term I will settle for a well run football club, that does things behind closed doors and doesn't wash it's dirty washing in public. The finishing touches of this week would be a win, any size win over Everton on Sunday, winning the derby and freeing the club of Hicks and Gillette, it would be a very good week. Just a brief posting, but how wonderful was it to see those Chilean miners released from their days locked in their tomb hundreds of metres below the surface. These monumental efforts by the miners surviving, the rescuers efforts to reach the miners and the courage of the miners families that believed in their rescue. I felt their joy, wasn't it just wonderful, I guess that is what makes us human. My family were North Somerset miners, I am happy the NCB closed those pits, I would have no desire to work under ground, but I have total respect for those men who did work in deep mining, being dropped hundreds of metres in a wire cage deep into the earth at 15 yrs old, yep, not for me! The Renewable energy has great opportunities in the west country, we have wind and tidal power to capture, this clean energy needs capture. These new environmental jobs should be growth here in the UK. Anyone who knows me, will tell you of my passion for the Mighty Reds of Anfield, it is one of the great sporting institutions in this country. Liverpool FC has a wonderful history, from that night in Rome to Istanbul, or those 18 league titles. Sadly for the last three years this great football club, that for years was ran 'the right way', has been owned on borrowed money by Tom Hicks and George Gillette. These two gentlemen encapsulates the sickness of modern capitalism. They bought Liverpool FC on borrowed money, when banks borrowed to anyone and money was too cheap and the cost of repayment was also cheap, they made promises of not to place any debt on the football club, build a new stadium and money for new players. Now debt is expensive they cannot afford Liverpool Football Club. Their first action was to place £280million of debt against the club, no stadium and the last three transfer windows LFC has delivered a profit to the Clubs owners. We are now in the endgame. Martin Broughton the independent chairman, who was brought in to find a buyer who claims to have undertakings to sell Liverpool FC from Hicks and Gillette along with Christian Purslow and Ian Ayre, have found a buyer. Hicks and Gillette have tried to remove Purslow and Ayre from the Board at LFC and replace them with their own stooges. So next week this mess will go to the High Court, if the courts back the Chairman, LFC will have new owners, if the courts backs Hicks and Gillette and they cannot refinance as they haven't managed in the previous twelve months, the club will be in administration this time next week. LFC will then be deducted 9 points, the banks presumably would sell to the current buyers. Football a working class game, treated as a play thing by businessmen with no interest in the beautiful game. My advice to Tom and George is respectfully, hold your heads up high and leave this mighty proud club, the damage done will be repaired, I can end my boycott of Anfield and I will again buy the replica shirt, I can again sing about the glories around the fields of anfield road. Debt, Lies, Cowboys Tom and George not welcome here. Whilst the media has been consuming the cut in child benefit to higher taxpayers, my eye has been taken by three inter related stories. The first is this coalition governments plans to abolish the Agricultural Wages Board, since the first world war this has set minimum wages for farmer workers. The second was the CBI calling for Agency workers to legally cover for striking workers. The third is the CBI and Boris Johnson Calling for a 50% turnout for a strike ballot. This country has the toughest anti strike laws, whilst strike action must always the absolute action taken by workers, this action is the last resort for workers. Low skill manual workers are completely undermined by agency workers, these workers has no sick pay, no holiday pay and no other social benefit, many local companies use agency workers, these workers are like those dock workers at the turn of the last century who turned up for work to be selected, if not selected there was no work. Last week the Labour Party debated why they lost many voters, Agency workers is one of the main ingredients why industrial employees were left feeling industrial flexibility was one way, low pay rises and many wages being forced to minimum wages, the loss of industrial muscle, as the industrial base reduced to many small employers with the loss of quality pensions and sick schemes. It is now a year since employers can use tips in the hospitality trade to subsidise the National minimum wage. This is why so many feel the inequality of wages between their own pay and their employers, I support the "Living Wage", the national minimum wage has it's uses, but £237 before tax is not enough to live on, the London Citizens has calculated that £7.50 is a more realistic hourly rate. So, the forward may be a High Pay Commission to look at the top end of the pay scale and the Living Wage needs investigation. Most people want a fair day pay for a fair day work, sadly I am not convinced if this can be said in modern Britain. Tonight I attended the most recent meeting of the community to discuss how to maximise efforts to improve our Town Centre. There were about 30/40 people at the Salvation Hall. 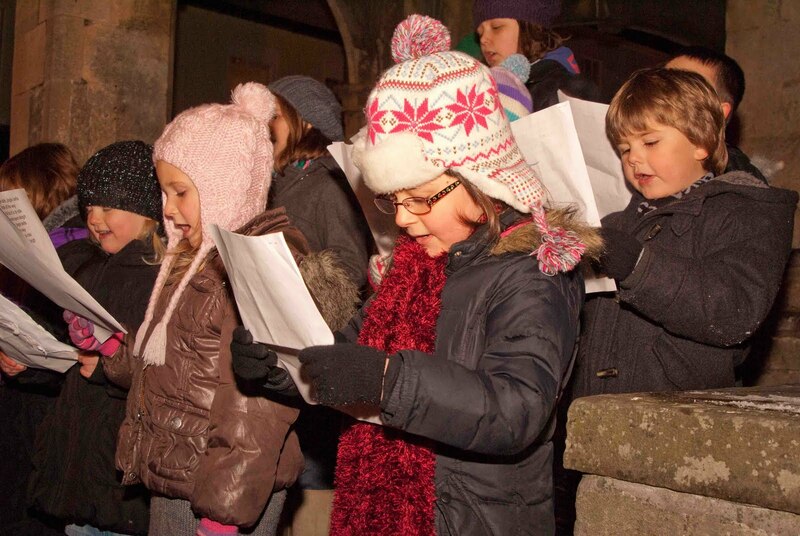 Like my previous blog, I volunteered my labour to support put on events in the Town Centre. The meeting voted to set up a Community Benefit Society, it looks like the steering group will take this forward. My councillor colleague was irriated when a member of the meeting said "he would like to shoot all councillors", Will Dunscombe pointed out that it was everyone responsibility to lobby Mendip Council on free car parking, but the member of the meeting was not bothered to distinguish between the different tiers of government or individual councillors opinions or efforts. Whether after 15 years my skin is a little less thick, but I felt there is a undertone of anti council/councillors at most meetings I attend, yet our interest in the Town means we still attend such meetings and volunteer our efforts. Moreover, for example I have attended meetings on monday night, Tuesday night, this evening and will be out tomorrow evening on community activity, I've dealt with tens of emails to do with Shepton this week so far, this a typical week for a parish councillor. The average parish councillors probably does the same. So I can understand Will losing his temper with people whom lazy talk could be considered both ignorant and wrong, parish councillors do not receive any renumeration (nor seeks it) and have Shepton at heart. So coming back to tonights meeting, I wish this group well. The political party I am a member has today elected Ed Miliband as leader. I had four votes, one Labour member, one trade union and two socialist societies. I have always been a supporter of one member one vote, the electoral college a left off from the early 1980s. I look forward to this leadership election being the last under the electoral college where MPs, members and affiliates vote. I look forward to Ed Miliband leading the Labour Party, from the political centre, to build a consensus around a platform around a social democratic vision for this country. Building a mass movement against the regressive coalition government, this conservative government. So I wish Ed Miliband good luck and hope Labour has started it's route back to government. The latest public meeting to discuss the Town Centre will be held on Wednesday 29 September in the Salvation Army hall in Commercial Road at 6.30pm, I hope to attend, but I have another engagement in Taunton that afternoon, so I may not make it. Create a series of popular events in market place. The Environment, some progress has be made in recent years with improved shop fronts, however the market place and Town Streets paving is poor, cracked paving slabs with a mish mash of paving slabs, I take the view, a road should be reintroduced into Town Street to recreate a street scene and this would allow service vehicles to use, saving the cracking of the paving slabs. There needs better lighting within the Town Centre, access from the car parks through to the shops in Great Ostry and Regal road needs attention. The Street furniture needs upgrading, some just needs better maintenance. The District Council has now received their Urban design statement, these issues have been highlighted. Town Centre promotion, there are many tremendous shops in Shepton Mallet High Street area, I often wonder if the average consumer knows whats on offer in the retail area, how the retail sector is strengthened by promoting the right shop for the right business? Finally on promotion does the average consumer wants a retail centre to thrive in the High street area? Business support, is it too simplistic to say, if your shop sells the right product at the right price with the right level of of service and consumers know what's on sale, the business is more likely to succeed? The other issue is free convenient car parking. I have pressed for years at the Town Council for the funding of Town Centre events, for me, these events deal with two issues, firstly they attract people into the retail area, secondly they deal with the community engagement of the Town Centre being seen as community space, a place you want to go. This to breakdown the negative atmosphere that sometimes exists around the Town. I have seen several community led groups form and I have supported them, whether the taskforce, or the Market and Coastal Town initiative (MCTi), having met with the Regional Development Agency on the successful application for the MCTi funding, my advice to any community group would be to keep it simple. From those priorities a lottery bid was submitted for an indoor swimming pool at the Leisure Centre and failed. The Town Council invested £355,000 and the District Council invested £150,000 to improve the outdoor swimming pool. The new community hall was morphed into a Community and Training Educational Centre, that grew Topsy, with an increasing number of consultants reports, the average Sheptonian wanted a basic community hall, CATEC has not been built nor has a community hall, this community aspiration not met. Better Bus Services - Shepton has still no direct bus services to Bath or Bristol, other than National Express, so no improvements to destinations, but the Cycleway on the Strawberry line has made progress and the Milestones have been painted. So, my advice to any community group would be to keep it simple, be very clear on whats to be achieved and keep Sheptonians informed. We are seven months away from elections for the Town and District Councils, last night we saw the first embers of the coming campaigns. It seemed to me that point scoring was back in fashion. We saw the standing orders abandoned for an attack on cllr Garfield, to be fair the Lib Dem District Councillor over stated his attack on the Town Council and it's management on allotments, but the Town Council's waiting time for allotments is too long, it would be better for cllrs working together rather than playing such naked opportunism by both parties. Myself and cllr Will Dunscombe tried to use the councils capital fund for additional monies for professional fees to conclude the enhancement of the Cenotaph, we argued that we needed to use the community development pot of money as budget to put events and create interest in the Town Centre, however we lost the vote 11 to 2 so this community budget will now be used for the additional fees for cenotaph enhancement. As I have reported before, the Town Council has a capital budget of £230K, it seem there is a three way fight for this spending, one option is to develop the toilets in Collett Park and maybe develop Office space for the Town Council, the second, to secure a office/ associated hall for the Town Council and the third, development of sporting facilities in the Town. I have repeatedly called for the Town Council to decide which option the council wants to pursue, wouldn't it be good for Sheptonians to be asked their opinion? The Town Council are interested in discussion with Mendip about the transfer of ownership of West Shepton Playing Fields, having held discussions with sporting clubs the Town Council are seeking to secure the playing fields long term future, also developing the site for sports. Mendip Councils long awaited Urban Design Statement for the Town Centre has been produced I raised the point that the Town Council and public should be able to discuss, we await developments. Tomorrow evening I will going to the Labour leadership hustings in Bristol, I will write a blog on my choice for leader. Today Tessa Jowell says she had her telephone tapped 28 times, this she claimed being told by the police and it's alleged a major News corporation being involved. The Conservative leader has the former News of the World editor as one of his advisers, earning a £140,000 a year, yet many websites allege that Mr Coulson, whilst he was editor of the News of the World illegal activity was conducted by a private investigator working on behalf of that paper, although Mr Coulson says he knew nothing of it. Despite this, the press complaints people did nothing, the Metropolitan police took no action against the paper or their direct employees, I take the view that the media should not be above the law, nor should the law be partial. I remember whilst the cash for honours investigation by the absolutely remarkable Yates of the Yard, how the media seemed to be there when Lord Levy was arrested etc. Yet the same remarkable Yeats of the Yard could find no evidence of illegal activity by the News of the World when phone tapping against government ministers. I believe a high level inquiry by a High Court Judge both into News International and the Metropolitan Police actions needs to be conducted, to give transparency and confidence of the media and the police. In the previous weeks the language from the coalition government seems to have reverted to the same old conservative stance. Last week was the charge of benefits cheats, let's be honest any benefit fraud is wrong and should be punished, but compared to tax evasion and none payment of tax is a smaller problem, so why does the prime minister focus more on alleged benefits cheats? A common theme since the coalition governments election has been the constant sniping at the public sectors pay and conditions, focusing on a small band that enjoy good employment terms, yet leaving the public with a view the majority of public employees are living off the backs of the tax payer in the age of austerity. The truth is the financial sector caused the recession and the deficits that resulted in the loss of tax revenues and additional spending to save the economy from a depression, not huge excesses of public sector workers, many of them being low paid. The ConDems are trying to create a toxic cocktail that gives legitimacy to cutting of benefits for the poorest and worsening of conditions of public servants, with the voters consuming of Cameron's guff and blaming the recipients of Conservative cuts. The proud boast of a new politics has simply evaporated, the politics of prejudges is back. The Audit Commission was abolished last week, everyone seems to respects their judgements, hugely disliked by leading Tories, just look at Mendip, they concluded they were failing to deliver value for money and no one knew what they were trying to do, the best way to end this scrutiny is to abolish or privatise this body. I suspect not too many voters will miss the Audit Commission because they quietly go about their business, but poor performing councils will continue to coast like Mendip. Stories of strange council spending will soon appear in the Tory press, more softening for the October spending review. Are we to be taken in by this or will we recognise what is happening? The Town Council has been consulted by Somerset Association of Local Councils on the Coalition governments proposals to cap the parish council rate. The first thing to be said is as most Parish Councils recess in August it is not a good time to consult with them and expect responses by the end of August, this would lead you to believe that the coalition government are not much interested in parish opinion. The second even in Mrs Thatcher days she did not think the local councils were made up of tax gorging maniacs. But this coalition government according to cllr Parham need to "control" the spending of local councils, largely by a incomprehensible local referendum proposal. The Town Council rejected any capping proposal and complained about the timescale for this consultation. But if the coalition need control of local councils spending, then they'll surely take control, and the parish pump will be controlled by expensive referendums at the costs of services. As regular readers will be aware I am a supporter of the Additional Member Voting System, this allows a constituency vote and a Party vote, so total votes and total seats are fairly proportional. This Alternative Vote system seems to me as not proportional nor fair, with the second place candidate the true beneficiary, so the second choice wins, I want to vote FOR a candidate and a Party and I want my vote to count. Parliament should allow a referendum on a proportional voting system and any boundary changes should receive the same scrutiny with public inquiry if necessary. The new coalition government is playing fast and loose with our unwritten constitution, maybe it's time for a written constitution and bill of rights, this to defend our constitutional rights. I see the You Gov tracker opinion poll now puts the Lib Dems on 14%, somewhat unsurprising as they have become consumed by the Conservative agenda. I believe Nick (Ramsey)McClegg made a fundamental mistake by not taking a leading portfolio, but seeing his performance in prime minister questions perhaps it's better he continues in the nodding dog mode. However Mr Cameron has made more than a little gaffe in America http://www.bbc.co.uk/news/uk-politics-10719739 , perhaps he can do as foreign professional footballers do, he can say it was out of context or misquoted, or more likely his friends in the media will just brush his lack of historic knowledge under the carpet. There was an interesting piece in the independent http://www.independent.co.uk/news/business/news/economy-set-for-triple-whammy-admits-bank-chief-2032213.html today. It warns of a Triple Whammy, higher inflation, lower growth and higher unemployment. The VAT rise in January will help fuel inflation, the cuts in the public sector will lower growth and both will cause employment. If we look at the tax cuts they propose will mainly benefit the conservatives friends, the VAT tax rise wipes out the benefit from the higher tax allowances for the lower paid, with freezing child benefit many low income families will be worse off, this before the unspecified public sector cuts. So the Con Dem budget is beginning to look worse even before it's enacted, Lib Dem voters believed they were progressives, 14% might look good for the lib dems in 2012. So overall crime fell last year and unemployment fell in the first three months of this year, when Labour was still in government, David Camerons narrative 'broken Britain' was rubbish at the election and remains rubbish today. Kenneth Clarke, the Conservative Justice minister rightly said that economic conditions play an important part in crime reduction, under Labour crime fell, yes for the vast majority of the Labour government we enjoyed the longest sustained economic growth, Labour invested in Sure Start, extended schools including breakfast clubs. It was sad the new CONDEM government cancelled the 500,000 additional free school meals for poorer children. The new CONDEM government are now cutting the support grant to councils, so the soft targets are going to take a hammering, these services will include youth services for sure, this will mean a reduction in service and remember we only have a youth club 2 evenings a week now in Shepton. Nationally 60,000 police officers will be cut in the next five years. I like Ken Clarke words, better support before young people get involved with criminal behaviour, this means investing in young people in their early years, improving educational opportunity, adding support through those school years with professionals helping those young people with acute needs, Labour was heading in that direction, I fear although Ken Clarke talks the right words, Mr Cameron and Clegg with their 25/40% cuts in public spending will undermine those words. I was reading a rather good book about the inter war years, the 1920 and 30's, the book dealt with politics, economics and news worthy stories. The story of Ramsey McDonald interested me, how he was persuaded to form a national government and how in 1931 he made cuts to government spending that made people poorer and forced the economy further into recession. The other historical moment that effected my life would have been when the IMF was called in in the mid/late 1970's, this again caused public sector cuts, I remember clearly, sharing a book between three children in many subjects at Whitstone, or teachers photocopying texts as there were no new books. The Thatcher monetary experiment in the early 1980's made the IMF intervention worse, further public sector cuts, with tax cuts mainly for the wealthy and transfer of taxation into indirect taxation like VAT. It took me over twelve months to get a full time job, with nearly four million unemployed. So to the present day, the recent emergency budget will increase VAT to 20% in January, cut corporation taxes to banks and cut public spending. The real problem is that by cutting public sector jobs now, hence taking money out of the economy, whilst the private sector is still not growing, will certainly cause a much reduced growth rate, without growth how does private business expand? Before long the economy just stagnates, moving in decreasing circles, less investment in public services, the wealthy can do without public services, ordinary people rely on public services. The other concern is the property market, if there is no growth in the economy, more people lose their jobs, with house prices locally inflated, how long before we have a Japan type property depression? History teaches lessons, sometimes it's important to learn from them. Tonight we held the July Council meeting. We discussed bollards in the Town Centre, I asked for a more creative approach with bike stands instead of bog standard bollards, a multi use solution. John Parham reported a £2.5million reduction in the rate support grant from the new coalition government to Mendip District Council. We nominated Terry Webb for an community service award. We have set up a working group to investigate reclaiming the West Shepton Playing Fields, new councillor Jeff Curtis running with this one, if older readers will remember I was suggesting this last year when the football club were having their difficulties with Mendip Council. We confirmed all our risk assessments and Health and Safety policy. A dull meeting but at least some progress was made. I see the CONDEMS are to hold the Alternative Vote (AV) referendum next year, this has to be illogical, not one major political party supports AV, Cons like First Past the Post, Lib Dems support Single Transferable Vote and Labour offers a referendum on AV. AV is not proportional, so does not offer fair votes, on this basis I see no point changing the voting system for a system is not proportional. Lets have a proper debate on a new constitutional settlement that offers fair votes and the decentalisation of power away from the centre and reform the constitution so citizens are the masters. Another heroic campaign has ended in defeat, I claimed 241 votes, I am as ever proud that so many Shepton residents should vote for me and the Labour Party. I must congratulate Mr Kennedy, Lib Dem on his win and my sympathy to Mrs Bartlett and Mr Britton who came 2nd and 4th respectively. I'll give it until the conclusion of the world cup, then the next campaign begins, onwards and upwards, the things that you care about, decent affordable housing, services for young people and educational achievement and improvements in our great Town, election defeats do not change these desires, these are the things I care about, so, as a Town councillor, governor and community member I will continue to work for this place I call home. We've entered the last week of the campaign in the Shepton West by-election, it really has been good to talk to so many residents, sadly I will not get to every door, they are well over 2000 homes and it is impossible for me to do that in 3.5 weeks. However the messages are clear, this re-inforcing my view most council discussions are not included on the residents most wanted, the process drives the discussion, highly reactive, it is a carousal easy to get on harder to break away from, a bit of a circus. Today, Mr Hunt MP, secretary of state for culture, made a gaffe in regard to the Hillsborough disaster, linking the disaster to football hooliganism, this of course was wholly wrong as the excellent Taylor Report made clear, he obviously then made a statement of a kind of apology, but the pain he caused the 96 families by his ignorant slip was unnecessary, Justice for the 96, Mr Hunt, Justice! Whilst on Football matters, what a terrible performance by England, 4-1 flattered us, but did anyone see the FIFA press conference, where the spokesman was left speechless at the wrongly disallowed goal, FIFA are fools, they will one day allow technology, pity it wasn't yesterday. Well done England, come on! Looking forward to Sunday afternoon. This evening I encountered some Conservative canvassers, but there candidate was no where to be seen. The weather is fantastic with most people out tonight, but some good conversations, these included sports development in Shepton, condition of our roads and the VAT rise, I did say Mendip didn't collect this tax! A couple of unhappy Lib Dem voters, said they were returning to Labour. Anyway, short and to the point tonight. A good evening on the doorstep, many positive discussions and promises of support. More issues raised including poor ground maintenance, lack of activities for young people and the poor conditions of the pavements in the town centre. Tomorrow will be an important day for this country, the ConDem budget will announced. The Office of Budget Responsibility has said that although growth in the economy may be lower than first thought, the deficit will be about where Labour had predicted, so there will be no financial meltdown. If the ConDems does slash spending and this heavily effects the growth rate this could make the deficit worse, which will cause higher unemployment, more home repossessions less economic activity. We know the Conservatives want to reduce the state spending by 20%. 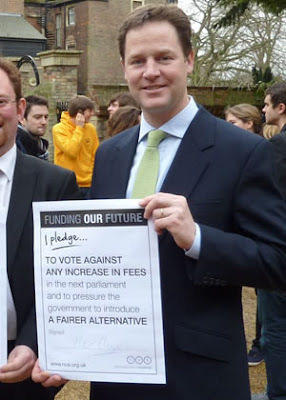 The Lib Dems position before the election was different, Nick Clegg said the decision who governs the country should not be in fear of what the markets might do, imagine a Conservative government who announces they want to slash public services in an early tough action, people in his constituents of Sheffield of which more people work in the public sector as a proportion of the workforce than anywhere else in the country, who are these people who want to slash the public services, when referring to the Conservatives plans to slash the public services, Nick Clegg said who are these people to take our jobs away, what mandate do they have, with no Conservative MPs or councillors as far as the eye could see. Indeed Mr Clegg, the Office of Budget Responsibility confirmed Labours level of borrowing was about right, your policy at the election was for no slashing of the spending this year, your mandate was for growth this year, after all, as you said by slashing spending could lead to social and industrial unrest, this would be the way to go about it. Having been lectured by local Lib Dems over the years for the new Academy schools and trusts for the corrosive effect that they had on comprehensive education, I see another white flag of Lib Dem policy with the new Free School policy, these free schools will opt out of local authority working, will compete for children, this particularly important as we have falling roles as here in Somerset. It looks like the building the schools for the future will be raided, the additional individual tuition fees to pay for struggling children in maths and english will be scrapped. Sometimes you can look at the same problem from different ends and it looks exactly the same. As a local councillor, I am deeply depressed about how dysfunctional local government is and how the structure is designed to fail. When out having conversations on the doorsteps peoples frustrations comes through, we know as councillors three tiers of local government is silly. The parish/Town council is largely a talking shop, partly of their own making partly legal, 16 councillors sitting around discussing Shepton issues with few resources. Mendip District Council is a small district council with a small tax base, highly dependant on central government grant, a disporportionently small cut in grant from government will either cause disporporationately large cuts in services or big tax increases, but as the CONDEMs have ruled out tax rises, this could seriously challenge Mendips viability. Somerset County Council behaves in a remote fashion, one of the major complaints I hear, time and time again is the lack of youth provision in Shepton, this is a County function. We are continually promised pedestrian crossings outside our schools, they are never delivered, some may say this is cynical politics by previous Lib Dem and current Conservative county councillors, what ever the reason, people are not happy. Bus services from Bristol do not come through Shepton onwards to Yeovil or Bridgwater, why does Shepton not have a direct bus service to either Bath or Bristol? The pavements and surfaces in the town centre are simply unacceptable, yet inaction by the county council. There are examples of how councils work together, the best example is Somerset waste partnership, this is where district and county form services, but both councils need not exist for somerset waste partnership to operate. For me we need a strategic tier of local government and a civic tier, Town Councils need to concerned with all aspects of civic pride, grass cutting, street cleaning, town promotion, simply how the town looks. Largely people don't care about this detail, they know there has been extensive housing growth in the town in the last 20 years, the rational for this is, this growth will lead to new services. Sadly for too long these new services have never materialised and provision of existing services has got worse, no wonder people are concerned, more tax for less service. Four more tactical lib Dems voters pledge there return to vote for me and Labour, they promise not to be taken in by the lib dems again. I had more really good conversations this evening, concerns about the performance of the district council was raised, grass cutting, tree management and other grounds maintenance. How services for young people needs to be developed in the town. The vast majority of people are unhappy about another by-election, people cannot believe the Conservatives have caused this election. I look forward to more conversations tomorrow evening. I had an enjoyable evening on the doorstep this evening, had several discussion on issues that matters to local people. Canvassing always is excellent, as a local councillor you understand what your constituents are concerned with, from overgrown trees to how councils include peoples views. From my point of view my returns are higher than last year and the mood more positive, just 17 days to go until polling day. Same old England, a painful watch, Stevie Gerrard had a good game, width was a problem, up side, we never lost, down side let a lead slip, no damage. Just got home from working at Collett Day, the weather was brilliant and I think everyone seemed to enjoy it. The 'mallet' was official unlocked, this is at the Tesco site by the Bus Station. It was a pleasure to meet and talk to people about Shepton and the various issues. I spent a couple of quid but not to much on stalls. I met the Lib Dem candidate for the Shepton West by-election, quite a political chap, had quite a robust discussion on why the lib Dems will lose out in their CONDEM coalition government, in the short term they are sunning in the CONDEM honeymoon, but in the long term I look forward to their huge defeats, the electoral truth is if the CONDEM are successful then the Conservatives will get the credit so the Lib Dems lose and if the CONDEMS fail then Labour will gain and the Lib Dems lose. But the real truth is Vote Lib Dem get Tory! With the nominations for the Labour leadership now closed, I think party members will have a good opportunity to discuss the qualities they want for the new leader. I do not support Diane Abbott, I do not agree with MPs whom do not agree with her supporting her, just to get her nominated, this is wrong and I hope the Labour Party does not regret this decision. I am minded to support David Milliband for the Labour leadership, he is extremely intelligent and thoughtful, and he can articulate the Labour case, he has experience of high office as the Foreign secretary. On another note, my serious campaign for the by-election starts tomorrow, so I hope to meet many local people as possible on my campaign. The three weekly planning meeting was held tonight. The issues tonight were, replacement shop frontages in 3 Town Street, this was recommended for refusal on the basis that there were too many new shop fronts looking the same and lacked diversity of design, although the address is in Town Street effectively the shop fronts are in the Market Place. However all councillors supported the idea of new shop fronts. Conversion of first and second floor to self contained flats in 47 and 49 High Street, these were recommended for approval, but concern about the flats not having wheely bins storage provision. The last item was from Flourish homes at the Hillmead area to demolish car barns, three bin store and refurbish seven bin stores and create two new play areas. This was recommended for approval, although concern was expressed that the new play areas were small and we suggested removal of a block of flats to allow a decent play area, concerns were expressed about loss of car parking. I was keen to express my view that a lot of money had been spent on the flats over the years, the old play area was lost for housing and significant investment was made in the flats years ago, now the housing company are spending more on the flats, but most people want houses and a garden, this should be a long term aim. Cllr Dunscombe tried to raise the new MOT bays workshop in Pauls Street, he was concerned that the new workshops distracted from listed buildings, sadly members who agreed the workshop were not keen to hear him. The Town Council recommended approval for this development on the 17 March 2009, sadly I was not a member on the Planning Committee at the time, I would of thought Mendip planners could have agreed better materials for this workshop. I am standing for the vacant Shepton West District Council seat, Mr Taylor was expelled for six months nonattendance, this will be the fourth by-election by Conservatives resigning or being expelled in the last thirteen months. You will be aware that I have been a vocal critic of the district council, especially as Mendip is failing, the Audit Commission reckon they do not meet minimum standards in the use of resources; managing the finances and governing the business. There is very clear criticism that Mendip Council has not done enough to help our community through the recession and more remarkable they do not seem clear on what they are trying to achieve. We have seen this in last weeks Shepton Journal, Mendip criticised for the way the organised the last Town Council by-election and the way they implemented the reduction in service for the grassing cutting, it is clear Mendip needs to work differently. I believe the district council has to do more on affordable housing, as is clear Mendip residents has lower income than nationally and higher house prices, this makes it more important to act on housing. There is no doubt that local government is faces huge reductions in central government grants, this will require Mendip Council to work differently, working with other agencies and voluntary sectors and of course the Town Council. This will require open and transparent government, it will require the conversations with the public, it certainly cannot behave like Mendip Council has for the previous years. In Shepton, Market Place and Town Street needs upgrading and a plan to increase footfall. I will update this site on regular occasions during the campaign, I hope to have many conservations on the doorsteps and the more entertaining will no doubt be of interest.